This book is a fascinating insight into Irish exile in the 17th, 18th and early 19th centuries, through the stories of a colourful cast of characters, all descendants of one man. It covers seminal events in European history, including the English Civil War, the Jacobite plots and the Napoleonic Wars. Categories: 18th Century History, Pre 18th Century History. This book reviews Irish exile between 1615 and 1820 through the descendants of Sorley Boy MacDonnell, a warrior-chieftain of the sixteenth century. Covering the Spanish Netherlands, France and Spain, it chronicles the stories of men who led colourful lives, which closely intersected with the major political and military events of the day. Part 1 covers the Spanish Netherlands. From Captain Sorley, who joined the O’Neill regiment in 1615 and was involved in several invasion projects to the naval captain who smuggled James II to France in a fishing boat; from one of the seven men to accompany Prince Charles to Scotland in 1745, to Enrique Reynaldo, an admiral who fought at Trafalgar and died a pauper, the book traces how one Irish family turned up in the most surprising of places. 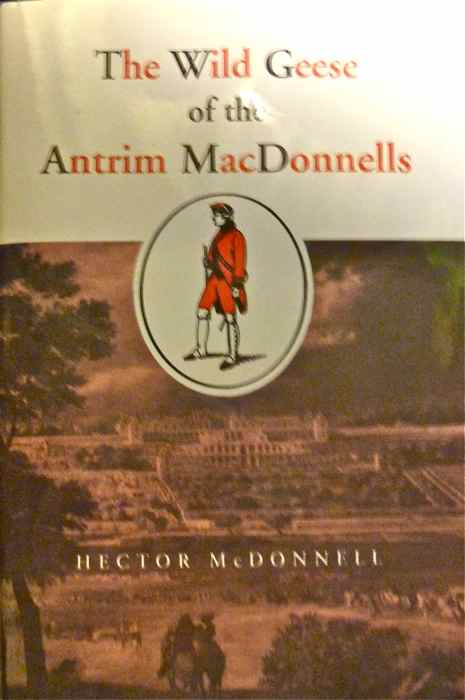 Hector McDonnell was born in Belfast in 1947, the younger son of the thirteenth earl of Antrim. He took a degree in Modern History at Oxford, 1968; since then he has worked as a professional painter but has also pursued his interest in Irish history, contributing articles to several journals, including the Irish Sword, JRSA, Glynns and UJA. He lives in Glenarm, Co. Antrim. The present book is the culmination of fifteen years’ research in archives both in Europe and the British Isles.